ECGWINE (ECGWIN, EGWIN, EEGWINE) of EVESHAM, the details of St. Ecgwine’s life are rather incomplete, and he is not mentioned by either St. Bede the Venerable (25th May), nor in the Anglo-Saxon Chronicle. However, St. Ecgwine’s name is recorded in the witness lists of seven charters issued between 692 and 717, and named as beneficiary, on Evesham's behalf, of three others. He is generally considered to have been the third Bishop of Worcester (circa 693 – 717), and founder of Evesham Abbey (circa 700 – 710), in present-day Evesham, Worcestershire, England. It is known without question that his final episcopal act was his participation at the First Council of Clovesho (Clofesho) in July 716. As bishop, St. Ecgwine endeavoured to get his flock to embrace Christian morality, especially regarding marriage and clerical celibacy, however, he met with great resistance, and was at one point forced to appeal to Rome. St. Ecgwine is generally considered to have reposed on 30th December, 717, though at least one scholar claimed it was 720. He was buried at Evesham Abbey, and in 1183 his relics were translated to a shrine in the Abbey, which, unfortunately, was destroyed, along with the abbey church, during the dissolution of the monasteries. EUGENE, (Date Unknown), a Bishop of Milan, of whose life nothing is known. LIBERIUS, an early Bishop of Ravenna in the Emilia-Romagna, who is considered to be one of the founders of that diocese. St. Liberius reposed circa 200. 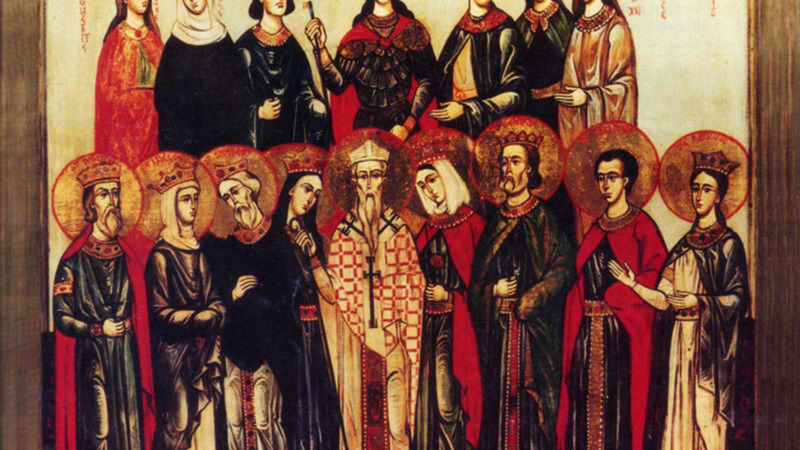 SABINUS, EXUPERANTIUS, MARCELLUS, VENUSTIAN, and COMPANIONS, a group of Christians martyred in Spoleto during the Diocletianic Persecution (303). In some martyrologies they are called the Martyrs of Spoleto. SEBASTIAN, consecrated Archbishop of Esztergom, Hungary in 1002. St. Sebastian worked with St. Stephen (16th August) in the evangelisation of the Hungarian people. St. Sebastian reposed circa 1036.